Well, BMW saw fit to finally give us clear lens like they have been doing in Europe for some time. Unfortunately the bulbs are still orange and create an "egg yolk" effect within the lens. US laws require that turn signals emit orange light so this poses a conundrum for how to get rid of the egg yolk effect and still stay legal. 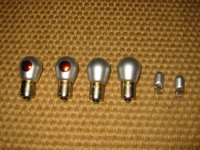 Platinum Vision bulbs available through Bimmian.com (a Canadian on-line and eBay seller) claim to get rid of the egg yolk. So what do you get and how well do they work? Once you open the package, the disappointment starts to set in. What you get are bulbs that are spray painted (and not well at that) with silver paint. 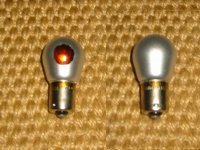 On one side of the bulb a circle roughly half inch in diameter is left unpainted, exposing the orange glass of the original bulb. The bulbs are all painted with the unpainted part pointing toward the right when installed in the car (the bulbs only mount one way) meaning that the bulb to your left have the unpainted circles pointed to the outside and the bulbs to the right have the unpainted circles pointing inside. Thus, the orange unpainted circle is visible from the left side of the vehicle. The side marker bulbs are totally painted over. Once installed they really don't look bad. 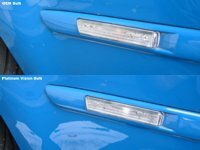 The bulbs which have the unpainted side pointing toward the inside of the vehicle effectively disappear in the lens and the other side's bulbs only show a small hint of orange through the lens. The side marker bulbs are invisible under their lenses. So far a few bugs and crappy quality but do they work - as in their real purpose, showing other drivers your intention to turn or providing a visible hazard warning? In a word NO! This is solely my opinion, but I think these bulbs are a hazard to your health. There is no way that anyone will see your turn signal during daylight unless they are 10 feet away from your car. I am hardly the most safety conscious person you will find but after installing the bulbs and turning on the turn signals on an overcast day to see how they work, I took all the of the Platinum Vision bulbs out and asked for a refund. 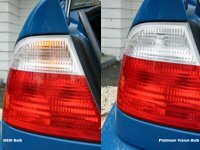 But, before I pulled them out I shot a series of short movies comparing OEM bulb brightness with Platinum Visions'. Please refer to the links below to start the movies (they range in size from 500k to 3mb). All of the movies (with the exception of one) were shot around 3 PM on an overcast day. The night comparison was shot about an hour after sunset. Comparisons were shot within 5-10 minutes of each other so the lighting conditions were identical. To give the Platinum Visions a benefit of doubt, I shot the movies from the side that had Platinum Visions mounted with the unpainted section pointing out - the other side's bulbs appeared about 25% dimmer then this side (talk about a stupid design either way). Watch the comparisons, realize that the camera actually accentuates light sources (making bulbs appear brighter) and then decide if your life is worth the risk.